People come to see Sheila Trecartin, a Pet Psychic in Thornton, Ontario, for many reasons. Sometimes their beloved pet is suffering from a health issue, and the owners would just like to find some alternatives to make the animal feel better. Sometimes the pet is exhibiting behavioural issues, and the owners turn to Sheila in desperation, hoping that the pet’s behaviour can be modified so that they won’t have to remove it from the home. In Interview with Pet Psychic Sheila Trecartin, I spoke to Sheila about how she discovered her ability to talk to the animals. Here, she describes how she regained her psychic abilities after closing them down for many years. She also discusses a few of the animals that she has helped. Val Tobin: How did you open up your abilities again and begin doing animal communication for other people? Sheila Trecartin: “I was on the phone, talking to a friend who lived about an hour away, and we were talking about different things. In my head, I kept hearing his dog. He was panicking and asking me tons of questions. So I started asking my friend questions. “He said, ‘Why do you keep talking about the dog? Where are you getting this information?’ So I bit the bullet and said, ‘Well, your dog is speaking to me.’ I really thought that he would say, ‘Yeah, right.’ But he didn’t. “He said, ‘Ask her this. Ask her that.’ So we talked for an hour on the phone and we talked with his dogs. Then he said, ‘You have to do this for other people.’ So, he called me three days later and asked me to go out with him. It turned out that I went to read my first horse. Val Tobin: Can you connect to an animal you haven’t even seen? Val Tobin: You can elicit cooperation from even wild animals? What Do Animals Want to Tell Their Owners? Val Tobin: Under normal circumstances, what kinds of things do pets want to talk about? Val Tobin: They actually get concerned about their owner’s career? 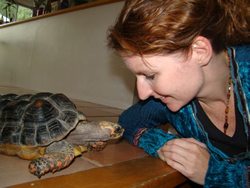 Sheila Trecartin has gained much recognition in the field of animal communication and offers courses so that others can learn this skill and communicate with any animals they wish. Trecartin says that the question most often asked by clients is if their pets are happy. People do love their animals and want to connect to them. Trecartin offers everyone a way to do that.